6 Bobbins For A Summerproject [G1184] - $7.10 : Yarn Tree, Your wholesale source for cross stitch supplies. Cross stitch pattern from Thistles. What a fun summer project! 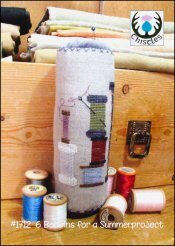 Look at this fun pincushion with 6 different bobbins stitched on it! The bobbins are stitched in different colors & sizes. Stitch count 57 x 68. Stitched on #4138 Zweigart Belfast Linen Raw 32ct. Confetti Aida 14, 35"x 39"